This exceptionally produced trainee guide features a highly illustrated design, technical hints and tips from industry experts, review questions and a whole lot more! Key content includes: Basic Safety, Introduction to Construction Math, Introduction to Hand Tools, Introduction to Power Tools, Construction Drawings, Basic Rigging, Basic Communication Skills, and Basic Employability Skills. A new module titled Introduction to Materials Handling has also been added! New printed instructor’s package includes lesson plans, instructor’s copy of trainee guide with an access code to download TestGen software, module exams, PowerPoints®, and performance profile sheets from www.nccerirc.com. NCCERconnect – eLearning Series is a new and improved online supplement in XL platform. This unique online course supplement in the form of an electronic book and essential course management tools is delivered through an exceptional user-friendly interface www.nccerconnect.com. NCCERconnect provides a range of visual, auditory, and interactive elements to enhance student learning and instructor delivery of craft training. (Module ID 00101-15) Presents basic jobsite safety information to prepare workers for the construction environment. Describes the common causes of workplace incidents and accidents and how to avoid them. Introduces common PPE, including equipment required for work at height, and its proper use. Information related to safety in several specific environments, including welding areas and confined spaces, is also provided. (Module ID 00102-15) Reviews basic math skills related to the construction trades and demonstrates how they apply to the trades. Covers multiple systems of measurement, decimals, fractions, and basic geometry. (Module ID 00103-15) Introduces common hand tools used in a variety of construction crafts. Identifies tools and how to safely use them. Proper hand tool maintenance is also presented. (Module ID 00104-15) Identifies and describes the operation of many power tools common in the construction environment. Provides instruction on proper use, as well as on safe-handling guidelines and basic maintenance. (Module ID 00105-15) Introduces the basic elements of construction drawings. The common components of drawings are presented, as well as the most common drawing types. The use of drawing scales and how to measure drawings is also covered. (Module ID 00106-15) Provides basic information related to rigging and rigging hardware, such as slings, rigging hitches, and hoists. Emphasizes safe working habits in the vicinity of rigging operations. (Module ID 00107-15) Provides good techniques for effective communication on the job. Includes examples that emphasize the importance of both written and verbal communication skills. Describes the importance of reading skills in the construction industry and covers proper techniques to use in a variety of different written communication formats. (Module ID 00108-15) Describes the opportunities offered by the construction trades. 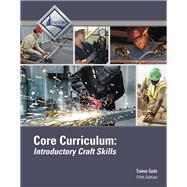 Discusses critical thinking and essential problem-solving skills for the construction industry. Also identifies and discusses positive social skills and their value in the workplace. (Module ID 00109-15) Describes the hazards associated with handling materials and provides techniques to avoid both injury and property damage. Common material-handling equipment is also introduced.